Seth Rollins and Dean Ambrose were the number one and two picks respectively in the WWE Draft. For the time being, that means the WWE Championship belongs to SmackDown, because Ambrose successfully defended his title against Rollins in the main event. Finn Balor was picked early, going fifth overall to Raw. Charlotte was picked well ahead of all other women at number three overall. John Cena and Roman Reigns are on separate brands, but were not portrayed as the faces of those brands. Luke Gallows and Karl Anderson were drafted together, but will not be on the same show as AJ Styles. There were also no big surprises. See below for more. Announced already on the pre-show for tonight: WWE Championship match with Dean Ambrose defending against Seth Rollins, John Cena against Luke Gallows, and Sasha Banks in a 2-on-1 handicap match against Charlotte and Dana Brooke. Stephanie McMahon, Mick Foley and Shane McMahon made their entrances on the pre-show. Daniel Bryan entered as the show started, and Mauro Ranallo and Michael Cole ran down the rules of the draft. Mick Foley was about to make the announcement, but Steph cut him off and made the announcement instead. Shane called him "Crossfit Jesus." Bryan called him the current and future WWE Champion. Mick Foley said they wanted a strong Women's Division. Steph gave them credit for picking Styles. As soon as Foley said their next pick would be from NXT, the crowd chanted for "Finn" and cheered when he was announced. John Cena's music hit after they announced Balor. Ranallo mentioned how surprising it was that the face of the company has yet to be picked. Cole, Lawler and Saxton are also on commentary. The set and logo are the same. Enzo and Cass cleared the ring of Styles and Anderson, and Cena beat Gallows after 5 minutes with the AA. Lawler went on about Cena not getting picked yet, and Cole acknowledged that Cena has a lot of other projects. They announced Darren Young and Zack Ryder against Rusev and The Miz tonight. Foley said he's not Steph's puppet, and sometimes they won't agree, and this pick was proof. Crowd booed the announcement. Crowd lightly cheered, keeping in mind he was just out there. Cole acknowledged that Cena and Styles are on the same show. Kofi Kingston, Big E and Xavier Woods staying together, of course. Young got a very mild hot tag, but looked good running wild on Miz. He hit the gut check on Miz but Rusev broke up the cover. Ryder gave Rusev a missile dropkick outside the ring. Young put Miz in the crossface chickenwing, which got a big pop, and Miz tapped. Match was about 4 minutes. New Day didn’t get an entrance. When the match started, Woods was mesmerized by Bray, but the moment he snapped out of it, Bray punched him in the face and took control. Woods made a brief comeback but was freaked out by Bray’s crab walk, allowing Bray to nail Sister Abigail for the win in about 5 minutes. The match never happened. As Owens made his entrance, he yelled at both Raw and SmackDown management teams for not picking him yet. Sami Zayn then ran out to his music and they brawled, but Owens cut him off with a superkick in the ring. Kane seemed like he was about to chokeslam Zayn, but he grabbed both men and chokeslammed them. Well, that’s stupid. Bryan called her the best women’s superstar. Backstage, Dean Ambrose said he could not be more excited to be working with Shane and Bryan. Ambrose said looks good in blue, and was bringing the WWE Championship to SmackDown on Tuesdays. Banks worked over Brooke early and gave Charlotte a double knee strike outside the ring, but Brooke knocked her down with a clothesline to gain control. Banks got Brooke with the Bank Statement, but Charlotte had made a blind tag and nailed Banks with Natural Selection for the win. This was 2 whole minutes. Bryan begrudgingly picked Miz because he wanted the IC Championship on SmackDown. Shane tore up some paper, making it seem like this would have been their next pick. Jericho wore a red scarf to go along with his red Raw t-shirt. He mocked Cesaro for not getting picked yet as the crowd chanted “stupid idiot.” Cesaro responded by killing him with uppercuts. Jericho went for a lionsault, but Cesaro popped up and did a Russian leg sweep off the middle rope, followed by a big swing and double foot stomp. Cesaro then went for a springboard uppercut, but Jericho nailed him with a Codebreaker for the win after about 5 minutes. During the match, Lawler wondered where the announcers would end up. They came back from break and there was a brawl outside the ring between Becky Lynch and Natalya. The announcers said Natalya was supposed to have a match but Lynch attacked her. A bunch of referees broke it up. The crowd cheered Lynch who came off well here. With Styles on Smackdown, The Club is no more. Bryan made the announcement, which got a big pop. He called them the best tag team in NXT. The crowd booed the pick and Shane mocked it. Steph said there was no woman quite like Nia Jax. Backstage, Seth Rollins said it felt phenomenal to be the number one pick and he was looking forward to working with Steph and Mick Foley. Rollins said there was no doubt he should’ve been the top pick, and no doubt he’ll walk out of tonight and Battleground as champion. The only doubt was in Roman Reigns. Rollins reiterated that he was always “the man” in the Shield. Ranallo said there were only 5 picks left on TV. 30 more picks would be made on the Network. They didn't air this, but on the website, Cesaro was one of few wrestlers who actually said he had a preference - and it was SmackDown. Before the match, Rollins attacked Ambrose from behind and laid him out, leading to a commercial break. Back from break, Ambrose told the referee to start the match, so they did. Rollins immediately hit a falcon arrow for a two count and took control. 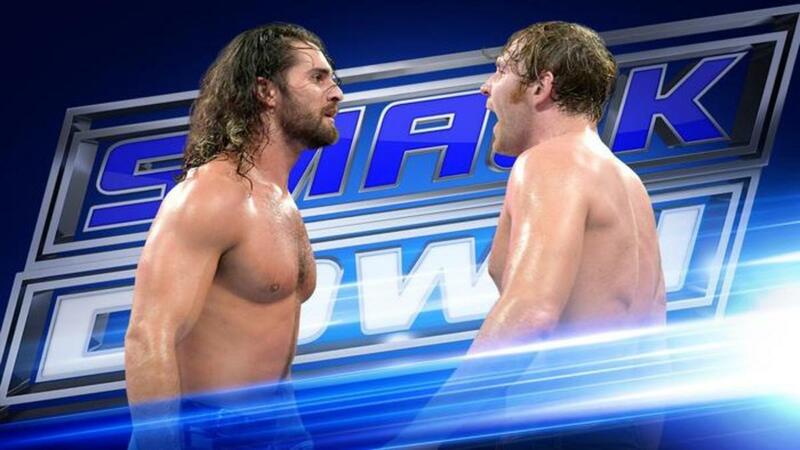 The match spilled to the outside, and Ambrose tossed Rollins into the timekeeper's area. Ambrose tried a splash off the table, but Rollins ducked and Ambrose slammed into the barricade. Back in the ring, Rollins hit a flying knee and superkick for a two count. Commercial break. Ambrose came back with a clothesline and neckbreaker. Rollins hit a buckle bomb but missed a frog splash, and Ambrose followed with a la magistral cradle for a two count. Ambrose then nailed a suicide dive and a flying elbow drop to the outside. Rollins hit superplex and tried to roll through into a falcon arrow, but Ambrose countered with Dirty Deeds for the clean win by pinfall. Big pop from the crowd. The match was 12-13 minutes. Daniel Bryan and Shane McMahon ran down to the ring in excitement and raised Ambrose’s hand. Ambrose put on a blue SmackDown shirt and Bryan led the crowd in Yes chants. The announcers plugged the big matches for Battleground. They came back to the ring and Ambrose continued his celebration as the crowd cheered. Cole told the audience to head to the Network for the remainder of the draft. The announcers put over the importance of the WWE title match on Sunday as it would decide which brand gets the championship. UFC Fight Night Brazil and Bellator 139 Picks From The Secret Psychic Spy~! UFC 186 betting picks from the Secret Psychic Spy~! UFC Fight Night 73 Picks From The Secret Psychic Spy~!